NEW! Bahco 4128-JT-H Winter Pruning Saw & Holster - 280mm Blade. Bahco winter pruning saw - ideal for wine and fruit growing. 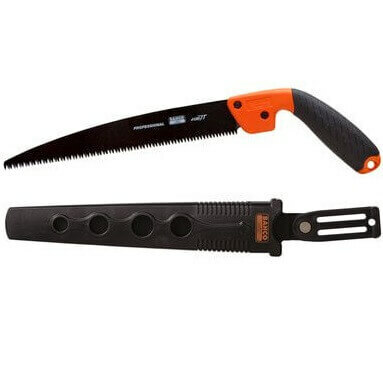 Features Japanese toothing blade designed especially for winter pruning. Less friction and a clean finish from conically ground profile. Japanese toothing provides fast and clean cutting. Refileable non-set teeth for a smooth cutting surface. Safer handling due to the integrated knuckle protector. Pruning saw supplied with safety holster. Also available in 240mm: B4124-JT-H.